That was the question on everyone’s lips, when our guide was discussing our sleeping arrangements for the Outback. In front of him, he laid out a dusty old swag – a type of tough bedding used in the bush. Smiling mischievously, he explained the flap was designed to fold over our faces and stop unwanted critters from crawling into our sleeping bags. Cue gasps of horror, followed by eyes darting warily around the campsite as we imagined a whole host of creatures sidling up to us for a goodnight cuddle. From slithering snakes to skulking spiders, Australia is notorious for its colourful wildlife. Whichever of the little beasties were out there waiting, I knew we were going to be in for an interesting night. 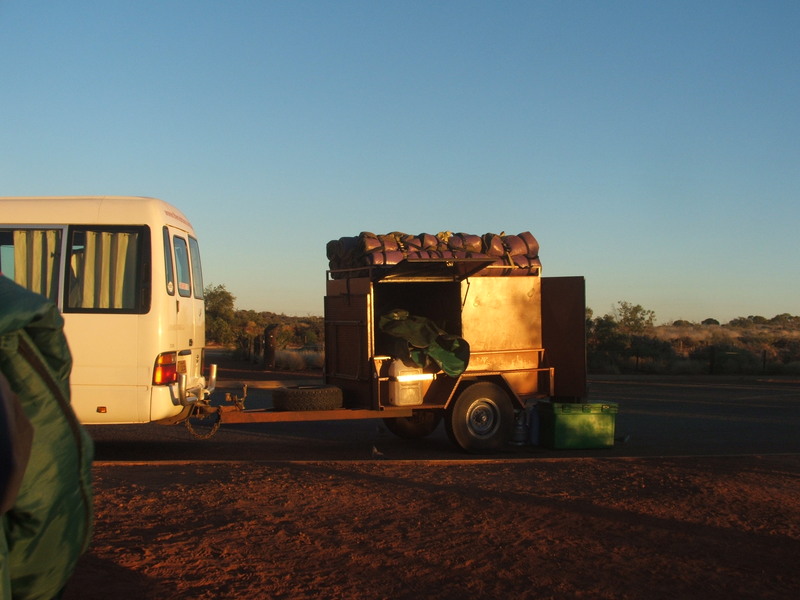 Earlier that morning, I had been collected from my hostel in Alice Springs for a three day escapade into the Australia’s wilderness. I couldn’t believe I was finally here. The Land Down Under had been beckoning for years and my trip would have felt incomplete without a visit to the Outback. 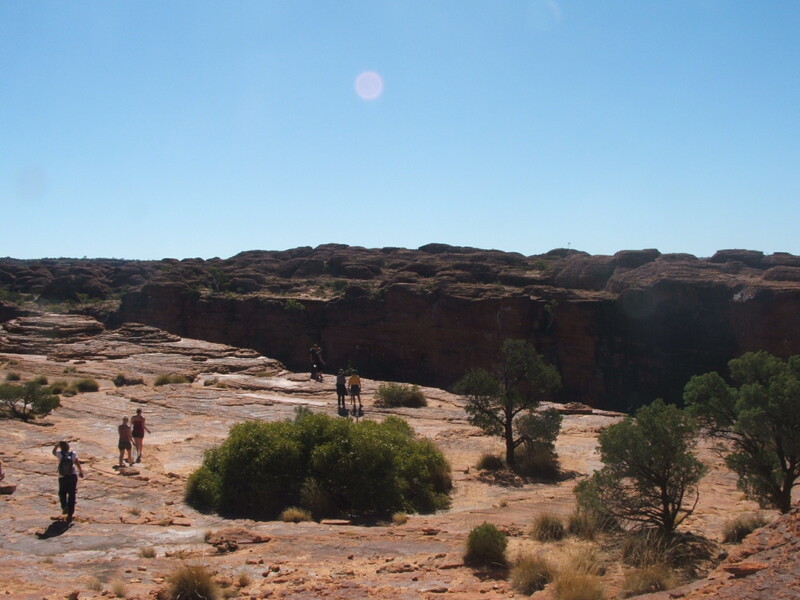 Yet for me, it couldn’t be just anywhere in the Outback – only the Red Centre would suffice. And it wasn’t for the lure of iconic Uluru either. Inexplicably, I had developed a strange fixation with seeing red soil. I can’t describe why I was so keen to find a pile of dirt, except perhaps that it appealed to my love of unusual landscapes. 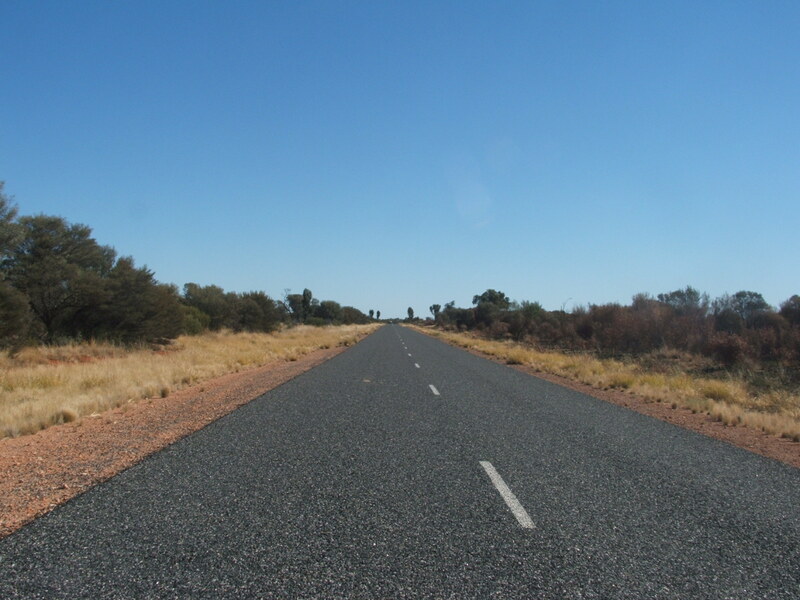 We drove down the desert road, eating up the miles as we headed further and further from civilisation. Somewhere beyond the distant horizon, I knew there must be farmers, or truckers, or other thrill-seeking travellers. But in that moment, it felt like we were the only souls in the world. 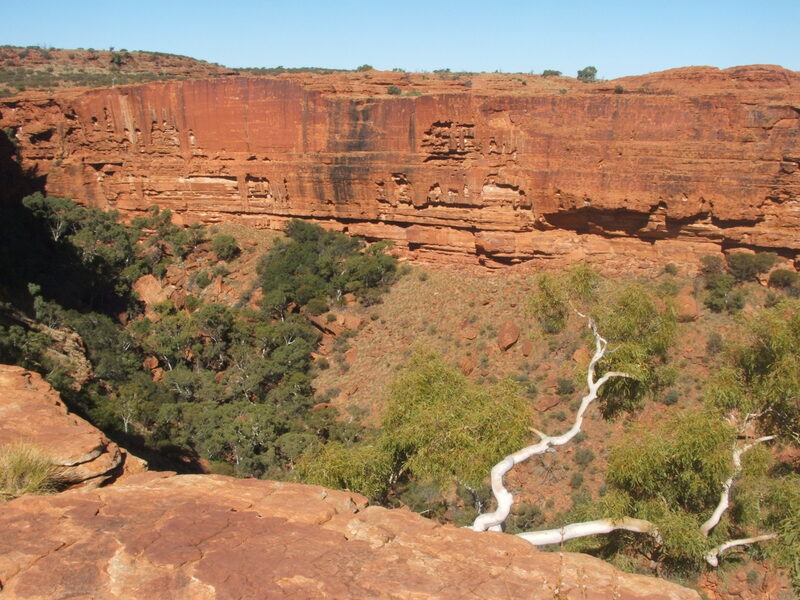 First on our itinerary was Kings Canyon – a giant fissure in the earth fringed with Eucalyptus trees. We began our walk by climbing a steep set of steps appropriately nicknamed ‘heart attack hill’. Huffing and puffing our way up, by the time we reached the top our hearts were thundering in our chests. We strolled around the canyon rim, peering into its depths, which were speckled with a surprising amount of greenery. Hidden amongst the trees was a natural pool of water called the Gardens of Eden, which helped explain the profusion of plant life. We climbed up the other side of the gorge, mesmerized by its sheer sandstone walls and the breathtaking drop. Some people ventured close to the edge to pose for photographs, but (not having the head for heights) I decided to keep my distance. Bidding farewell to Kings Canyon, we hopped back into the minibus and continued driving toward our ultimate goal – the behemoth rock known as Uluru. Suddenly our guide stopped the vehicle. Encouraging us to get out, he pointed enthusiastically to a suspicious looking mound in the distance. Eagerly, we grabbed our cameras, before quickly realising it was an imposter. He then revealed that it was actually Mount Connor, or “Fool-uru” to us tourists (insert canned laughter). As the sun dipped lower in the sky, we stopped again to forage for firewood. The bone-dry snap of branches could be heard as we broke them off desiccated bushes. With the daylight waning, we hastily prepared our camp. Darkness descended like a purple veil. The swags were spread out in a circle around the fire, while our guide put his culinary skills to the test. Flames crackled quietly as the smell of gently bubbling chilli rose from the pot. After dinner, I settled into my sleeping bag and stared up at the night sky. It was crisp and clear – a novelty for a native Brit whose view is usually obscured by clouds or light pollution. My eyes slowly adjusted to the dimness and to quote a certain Kylie Minogue song – wow wow wow wow! Millions of stars twinkled above, as though swept by an artist’s paintbrush across the dark canvas of night. Normally I’d be searching for the Plough, but this was a different hemisphere with a new set of constellations. I looked for the Southern Cross, yet it was impossible to distinguish amid the sea of celestial lights. Fighting sleep, I willed my eyes to stay open for a few minutes more. The fire dwindled to embers and all was quiet. Abruptly, something scurried past the back of my head, it’s little feet scuffing on the material. Jumping up, I reached for my torch and shone a spotlight on the ground. I breathed a sigh of relief – it was just a mouse. We had been warned to expect them by our guide. They were white, tiny, and really quite cute. I wasn’t bothered, for they only added to my list of unique travel experiences. Plus mice were a good sign. In the summer, there aren’t any because the snakes have eaten them all! The next day, I woke up feeling slightly confused, having burrowed down deep into the swag to keep myself warm. I lifted the monster flap and squirmed free. We had an early start, so I forced myself to get ready in the freezing darkness. Before dawn arrived, we hot footed it up a slope of loose sand to catch the morning sunrise. 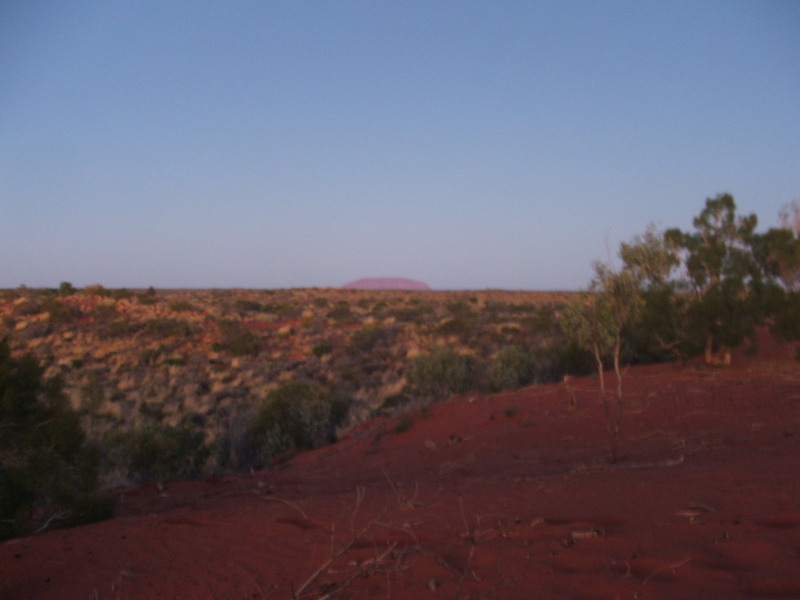 I glanced down and beamed with sudden delight – I had finally found my red dirt! Excited by my discovery, I nearly missed the bigger (and far more interesting) picture. Looming in the background, was the promise of what lay in wait for us that afternoon. No problem!! Im so jealous! I need to go to Australia!